Cedar Creek Anticline (CCA). CCA is the largest potential EOR property that we own and currently our largest producing property, contributing approximately 24% of our 2017 total production. 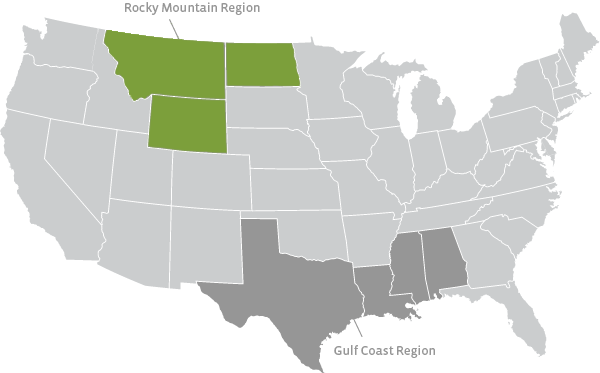 The field is primarily located in Montana but covers such a large area (approximately 126 miles) that it also extends into North Dakota. CCA is a series of 14 different operating areas, each of which could be considered a field by itself. We acquired our initial interest in CCA as part of the Encore merger in 2010 and acquired additional interests from a wholly-owned subsidiary of ConocoPhillips in the first quarter of 2013 for $1.0 billion, adding 42.2 MMBOE of incremental proved reserves at that date. CCA is located approximately 110 miles north of Bell Creek Field, and we currently expect to ultimately connect this field to our Greencore Pipeline. Our current plan for initiating a CO2 flood at CCA is several years from now, the timing of which may change depending on future oil prices, pipeline permitting and sources and availability of CO2. Grieve Field. In the second quarter of 2011, we entered into a farm-in agreement, under which we obtained a 65% working interest in Grieve Field, located in Natrona County, Wyoming, in exchange for developing the Grieve Field CO2 flood. We completed a three-mile CO2 pipeline to deliver CO2 from an existing CO2 pipeline to Grieve Field in the fourth quarter of 2012. During the third quarter of 2016, the Company and its joint venture partner in Grieve Field reached an agreement to revise the joint venture arrangement between the parties for the continued development of the field. The revised agreement provides for our partner to fund up to $55 million of the remaining estimated capital to complete development of the facility and fieldwork in exchange for a 14% higher working interest and a disproportionate sharing of revenue from the first 2 million barrels of production. As a result of this agreement, our working interest in the field was reduced from 65% to 51%. This arrangement accelerated the remaining development of the facility and fieldwork, and we currently anticipate first tertiary production in mid-2018. Hartzog Draw Field. We acquired our interest in Hartzog Draw Field in the fourth quarter of 2012. The field is located in the Powder River Basin of northeastern Wyoming, approximately 12 miles from our Greencore Pipeline. After successfully completing 5 wells in Hartzog Draw Field in 2014, we suspended the non-tertiary development of Hartzog Draw Field in light of the oil price environment. Activity around this field has continued to increase over the past year, with several operators testing various formations for potential development. We believe the oil reservoir characteristics of Hartzog Draw Field make it well suited for CO2 EOR in the future. We currently plan to initiate a CO2 flood at Hartzog Draw Field several years from now, the timing of which is dependent on capital availability and future oil prices. All content included on this site, including all text, graphics, logos, and software, and the compilation of the components of this site, are the property of Denbury Resources Inc. and are protected by all applicable U.S. and international copyright laws. THE SITE AND ITS CONTENT MAY ONLY BE USED AS PERMITTED BY DENBURY RESOURCES INC. ON THE SITE; ALL OTHER USES, INCLUDING COPYING, DUPLICATION, REPRODUCTION, MODIFICATION, DISTRIBUTION, TRANSMISSION, REPUBLICATION, DISPLAY OR PERFORMANCE, IN WHOLE OR IN PART, OF THE CONTENT ON THIS SITE ARE STRICTLY PROHIBITED WITHOUT THE EXPRESS PRIOR WRITTEN CONSENT OF DENBURY RESOURCES INC.